SUBHEAD: Obesity rates now nearly double Japan average — Excessive weight gain after nuclear crisis “a marker of radiation brain damage”. 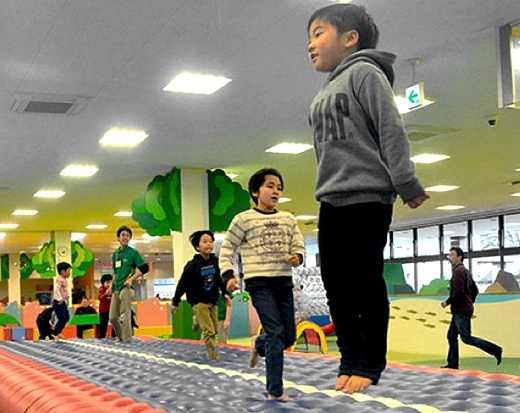 Image above: Children play in a facility in Koriyama, Fukushima Prefecture, on Dec. 10, 2014. From (http://ajw.asahi.com/article/0311disaster/fukushima/AJ201501240044). Accident at the Chernobyl NPP… was followed by the intensive release of a wide range of radioactive elements with affinity to many endocrine tissues. The mentioned radioactive fallout resulted in both internal and external radiation exposure, among others, of the central endocrine structures of the human brain. Received data indicate to the increased risk of borderline obesity and obesity after the prolonged exposure to radiation in moderate doses. The mentioned risk is stipulated by disorders in melanocortin system resulting in α-MSH deficiency at the background of obesity that can be considered as a marker of such an abnormality.